Hiclone maximizes the airflow and gathers fuel to the center of the air stream, then rapidly moves it to the combustion chamber preventing the adhering of particles to the wall of the intake system. Swirling fast-burn, near-complete combustion increases power output. The “Street Commodore” Magazine power test is at the bottom of this page. For Turbo vehicles installing Hiclones before and after the turbo gives better results. A unit before turbo will bring the boost in earlier and after the turbo improves combustion. 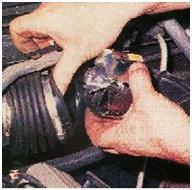 A Similar improvement is achieved on non-turbo vehicles when two or more Hiclones are installed. The first time Hiclones were ever fitted to a Turbo engine, before the Turbo was in 1995 on a Mitsubishi Lancer GSX Rally Car - One Hiclone near inlet manifold achieved a 5kw gain. One Hiclone near the air filer before the Turbo achieved a 7kw gain. Both Hiclones fitted before & after the Turbo achieved a 9kw gain. Since this we have been banned from Rallying, Formula Ford, Formula V & even Go-Karts! Plus many other forms of competition, but we also know of many competitors who find ingenious ways to fit our products. You came across some unusual devices that claim to increase power, but this funny little ring actually works! Godfrey Town reports. Anyone who tells you that dyno testing is straight forward hasn’t done any testing. Even with the temperature correction probe in the air cleaner box inlet, Consecutive dyno runs usually very. In fact, over four runs it’s not at all uncommon to see peak power variations of five per cent. To prevent false results clouding the issue, we averaged the power curve from both ramping upwards and downwards – something I’ve not seen other people using the same brand dyno bother to do. (This takes into account the rolling inertia of the dyno itself.) And secondly we keep pulling power runs until the curves draw over themselves – the power being stabilized as much as possible. Without the Hiclone in place the power curve stabilized at 115hp at the rear wheels. Incidentally that shows how strong an engine the standard V6 with extractors and an exhaust really is! But, while the standard engine’s peak hp figure was 115, one pull resulted in a 121hp peak! See how easy it is to rig the results? With the Hiclone in place the first run gave a peak of 117hp (2 up over standard), before the power stabilized at 119hp. 119hp is four more rear wheel horses than standard and assuming a conservative 23 per cent drive train loss is just over five hp at the engine. The power gain started from 80 km/h in second gear and remained a consistent three-four hp from there up. Ken was driving his car on the rollers. Leon was averaging the ramp-up and ramp-down graphs on the computer screen. I was looking incredulously at the screen – a power gain from that tinny little thing!!? On this VR Commodore, standard but for extractors and a 2.5 inch exhaust, the correctly-mounted Hiclone gave a peak power improvement of 3.5 per cent, without losing any power lower in the rev range. The Hiclone cost $160 fitted, which works out to about $30 per horsepower. The Makers also claim improvements in fuel consumption, emissions and engine smoothness.